Six U.S. firms notified us that they received an email from the purported Ellison Kazumi looking to retain them with regards to a collecting overdue payments resulting from a separation agreement. Please advise if you handle child support enforcement in violation of a court order? We entered a separation agreement incorporated, merged into and made part of the court decree for a settlement of child support, spousal support, and medical support of $843,250.00, he has paid me $331,500.00 but still owing $511,750.00 and he refuse now the stipulated time for completion of payment has long elapsed and i know he has the financial means to pay the balance owed to me. And he refuse to produce the balance I request your legal services with regards to compelling him to remit balance owed to me with full force Mr. Ellison now lives in Knoxville, TN He is a citizen in your country. Please Attached to this mail is a copy of the Separation Agreement and the Final Judgment.I will be pleased to provide further information on this case on request and I expect this to be resolved in a timely manner. 7B, 9-15 Naka-ku, Nagoyashi, Japan. 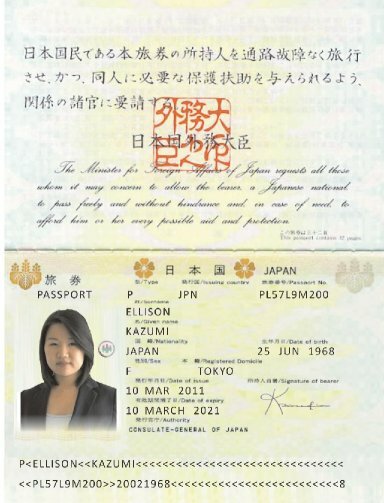 Probably all these Japanese divorce support requests are being sent out by our old fraudster contact Fumiko Anderson with new name and new passport photo. Note that she does not change the spot on the passport where the red hand stamp contacted the paper. Her divorce judgment should raise questions among the marginally alert for the following reasons: 1. It’s a Japanese court order written, mostly, in English. 2. The “witnesses” have Chinese names. 3. Some of the Asian language appearing on the document is actually Korean. 4. There is no provision in the document for visitation of the children by their father. This web site is probably the reason for the name and photo change, but the format won’t change – it must be working to some extent. My law firm has, in the last two weeks, received three separate emails from this same person/entity. At first, it seemed legit, so the scam is well prepared, especially with the passport photo. They even gave a local address. What tipped my off was that the “separation agreement” and “final judgment” were in English from a Japanese court (which does not happen) and secondly the few “characters” used to mimic Japanese are actually Korean. I filed a complaint with FBI, but doubt anything will be done.